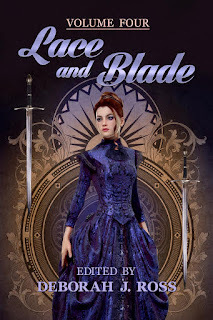 Just in time for Valentine's Day, Lace and Blade 4 offers a bouquet of sensual, romantic, action-filled stories. It's now available in trade paperback, Kindle, Nook, and other ebook editions. Publisher's Weekly: Dave Smeds’s “The Wind’s Kiss,” ... captures not only the imagination but also the heart, leaving behind a sense of peace and longing. India Edghill’s “Pawn’s Queen” follows a young woman on the path to her own destiny, seamlessly marrying a feast for the senses with the darker whimsies of magic and duty. Marella Sands’s excellent “The Game of Lions” focuses on the strength of bonds between sisters and teammates. The ... stories evoke wonder and excitement. Kevin O'Brien: This volume contains thirteen stories that range from action tales where romance is at best a subplot, to love stories with nary a hint of violence. Similarly, the romance varies from intense to casual, with both men and women as the aggressors. Also, the level of intrigue ranges from being the point of the plot to being practically non-existent. The level of quality is consistently high, I found no typos or obvious grammatical errors, and those stories set in alternate realities had good world-building; the settings felt real, not thrown together with spit and tissue paper. And if you enjoyed this anthology, please post a review! My novelette, "A Borrowed Heart," appears in the new anthology, It Happened at the Ball, edited by Sherwood Smith. I've finished the first draft of the next Darkover novel, The Laran Gambit. Short story sale: "The Fallen Man," a Renaissance artist finds magic in her paintings, to Sword and Sorceress 33, November 2018. Lace and Blade 4. Table of Contents here. Stories by Marie Brennan, Carol Berg, Judith Tarr, Lawrence Watt-Evans, Diana L. Paxson, Doranna Durgin, and more! Crossroads of Darkover. Table of Contents here. Stories by Jenna Rhodes, Pat MacEwen, Gabrielle Harbowy, Evey Brett, Rosemary and India Edghill, Diana L. Paxson, and more! Book Reviews: Masquerading as Science Fiction? Please let me hear from you! My shiny newsletter includes snippets of stories in progress, free ebooks and other swag, articles on writing craft, submission information for anthologies, favorite recipes, and a ton of other cool stuff. Sign up here. Check out my ebooks here. When you buy through Book View Cafe, 9o% of the proceeds goes to the authors themselves. Fabulous Times for Astronomy (and Other Science).